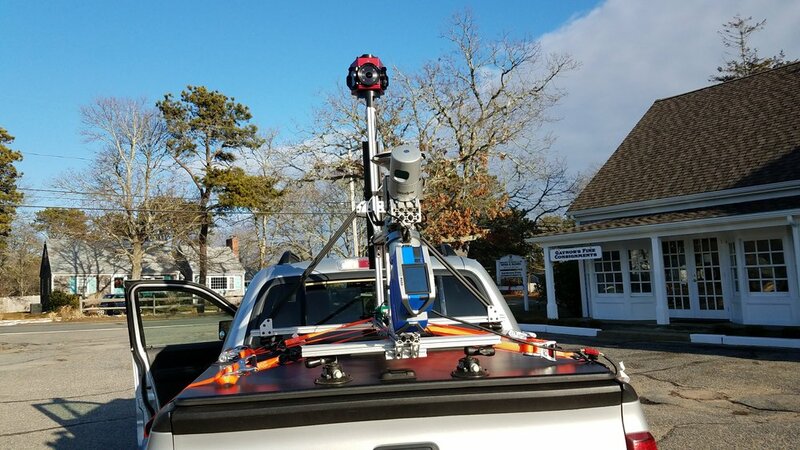 Eldredge Surveying & Engineering, LLC (ESE-LLC) is proud to announce the implementation of both Mobile and Static LiDAR to our list of services offered. LiDAR or Light Detection and Ranging utilizes lasers to acquire the locations of just about everything within the unit’s line of sight. The immediate result is a data set known as a point cloud with XYZ values for each point scanned. Each point also includes an intensity value or the reflectivity of the object. The point cloud can be enhanced by colorizing the points based on photography. The point cloud programs will modify the clouds to colorize based on intensity, elevation, file or classifications. Various data extraction tools can be implemented to transform the cloud into 3-d or 2-d CAD models. ESE-LLC uses the LiDARUSA ‘Snoopy’ with the FARO Focus X330. The unit mounts on just about any vehicle. There are two important pieces of data: the path and the scans. The path or trajectory is based on a GPS with complementary IMU (Inertial Measurement Unit aka gyros). The scan data comes from 33 lasers contained in two devices on the unit. The lasers can acquire up to 1.67 million points per second at accuracies ranging from 2mm to 2cm. A 360° camera is added for imagery. The post processing software then sorts all the data and produces a series of point cloud files. Passive ground control can be applied to verify and refine the point cloud. Thadd at training, June 30 - July 2, 2014. A rosa rugosa bush from a scan. · Path – The route of the project should be preplanned. Areas of interest and areas with anticipated shadowing should be scanned multiple times. · Time – The route timing should be determined. Areas with heavy traffic flow should be avoided at certain times to increase the amount of roadway that can be observed in each pass. · Control – Survey control is recommended for the adjustment and verification of the output point cloud. The amount of control required depends on the project requirements, speed of the vehicle acquiring the data and expected GPS outages due to canopy, buildings or other features. Generally, horizontal control targets should be placed every 1,000 feet and vertical control points should be placed every 200 feet, but these intervals will change based on acquisition speed. · Base GPS Stations – The GPS data recorded on the unit must be combined with GPS data from one or more base stations. The processing software supports multiple bases which are recommended. The recording interval of the unit is 5 Hz or once every 0.2 seconds. Running a base at 1 Hz or 1 second interval is sufficient, but a configuration at 5 Hz is preferred. The range of the GPS base stations is a consideration, especially for larger projects. CORS and private networks generally provide excellent results, but the distance from the project location may not allow for the solution of every observation. · Ground and Weather Conditions – Weather is a major variable in any outdoor activity. Running the mobile unit during precipitation is not recommended. Apart from the risk of damaging the equipment, lasers will reflect, refract or return from precipitation resulting in inconsistent data. Wet roads, puddles, ice, snow banks, sand, salt, leaf debris and everything else that can reflect or be seen will have a direct effect on the clarity of the point cloud. · Space Weather – Any GPS operation will be affected by the space weather, most of which is created by activity from the sun. 2014 was predicted to be a very active year, but it was not. There are speculations that the typical solar cycle slipped and that 2015 will be an active year in the ionosphere. · Cleaning – If planned street sweeping or other maintenance activities are known, a project could be timed for just after the streets are cleaned. · Coordinate System – This has to be determined at some point. We can provide projects on any defined coordinate system; the standard systems, NAD83 (2011) and NAVD ‘88 are recommended.